The contents of this thesis report the characterization of novel complex-oxide single crystals that are candidates for the discovery of new multiferroic materials and the realization of strong magnetoelectric coupling. The primary method of characterization is infrared spectroscopy in either reflection or transmission geometry, as governed by the material's optical response over a given frequency range. Optical properties are estimated via Kramers-Kronig relations and by fits to a Lorentz oscillator model. In certain materials, infrared results have motivated further characterization techniques: namely, magnetic susceptibility, x-ray diffraction, Raman spectroscopy, and terahertz spectroscopy. The specific materials studied are identified along with a short statement describing the major experimental findings resulting from each study. The Cu$_2$OSeO$_3$ system exhibited anomalous behavior of its infrared active phonons across the ferrimagnetic ordering temperature (T$_c$=60~K), which contributed to an abrupt change in the dielectric constant at the onset of magnetic order. The FeTe$_2$O$_5$Br system displayed a highly anisotropic phonon spectrum, which was corroborated by theoretical lattice dynamical calculations. In the Cu$_3$Bi(SeO$_3$)$_2$O$_2$Cl system, 16 new infrared phonons were observed below 115~K despite the lack of a structural transition, and 2 magnetic excitations were discovered below the long range magnetic ordering temperature (T$_c$=24~K). The Cu$_3$(SeO$_3$)$_2$Cl system, which is still a work in progress, has shown drastic phonon anomalies near both 80~K and 40~K (suspected magnetic ordering temperature) suggesting the existence of a rich phase diagram. In the series University of Florida Digital Collections. Description based on online resource; title from PDF title page. This bibliographic record is available under the Creative Commons CC0 public domain dedication. 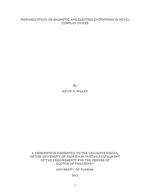 The University of Florida Libraries, as creator of this bibliographic record, has waived all rights to it worldwide under copyright law, including all related and neighboring rights, to the extent allowed by law. Thesis (Ph.D.)--University of Florida, 2013.